The CALIFORNIA AIR TOOLS 30020CAD Ultra Quiet & Oil-Free Air Compressor is designed to be one of the quietest 2.0 Hp air compressors in the industry having only 70 decibels of sound. The Powerful "New" 2.0 HP (SP-9421) motor operates at only 1680 RPM creating less noise and less wear. The CAT-30020CAD Air Compressor has a Oil-Free Dual Piston pump designed to have a life cycle before wear of 3000 Plus hours compared to other comparable air compressors with life cycles of 500 hours or less. The Easy Start Valve feature allows for a easier start up using less starting amps. The Easy Start Valve releases a small amount of air from the pump at start up to produce a no-load condition allowing the motor to spin freely. This no-load start up requires less amps for a easier start up in cold temperatures. 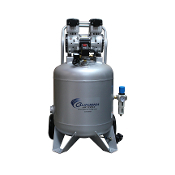 The large 30 Gallon Steel ASME Air Tank is designed to store more air for higher demand air tools such as spray guns and sanders. Prefect for the shop or garage. The 2 wheels and strudy handle makes moving this air compressor very easy. * The California Air Tools EZ-1 Automatic Drain Valve has been designed to eliminate manually draining your air compressor air tank.